Michel Barnier has indicated he does not believe the UK will have enough time to approve Theresa May's Withdrawal Agreement by March 29. The EU's chief negotiator suggested a "technical extension" of up to two months may be needed. MPs have been told that a "meaningful vote" on the prime minister's deal will take place on March 12. Asked if he thought it was possible to reach an agreement by March 29, even if Westminster gave the green light this month, Mr Barnier told Spain's El Mundo newspaper: "No." Referencing a technical extension, Mr Barnier added: "But you’ll have to ask the United Kingdom. If there is a vote on the 12th and it takes two months to carry out the procedure, it would be justified." Mrs May has said that if her deal is rejected by Parliament, MPs will be able to vote on whether the UK can leave the EU in a no-deal scenario, and if that is rejected, the Commons can decide on whether to extend Article 50 and delay Brexit for a limited period. Mr Barnier has also stated that Brussels is ready to give the UK further "guarantees, assurances and clarifications" that the Irish backstop should only be temporary. How far will the Brexiter ERG MPs capitulate? He insisted that the controversial measure, intended to avoid a hard border on the island of Ireland, will not be removed from the Withdrawal Agreement. While acknowledging Brexiteer concerns that the backstop is a trap that would keep the UK tied to the EU indefinitely, Mr Barnier insisted it is only "insurance" intended for the "worst-case scenario". 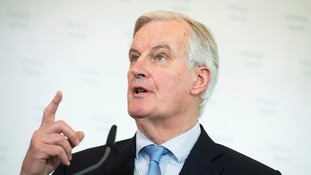 Speaking to German newspaper Die Welt, Mr Barnier said: "We know that there are misgivings in Britain that the backstop could keep Britain forever connected to the EU. The guarantees in question could come as an adjunct to the Withdrawal Agreement in the form of an "interpretive document", he said. However the EU will not allow for a time limit to be placed on the backstop or give Britain the right to unilaterally pull out of it, Mr Barnier added. Chief Secretary to the Treasury Liz Truss warned on Friday that a new Brexit referendum would provoke a "massive crisis". She also indicated that a no-deal exit could be better than a delay. "There will be a massive crisis in this nation. And it would be terrible for business. It would leave us continuing in this limbo period."